Today we will be creating a Basic JDBC application i.e. an application that will be able to retrieve information (student_name, roll_no, class, DOB, etc) from the database. I already gave a tutorial on connecting SQL Server using JDBC-ODBC Bridge. And for the first time I will be showing on Code 2 Learn how to compile and run a java program from the command promt. * Click the start button and then type "odbc" and you will get the result as Data Source (ODBC), open the same as an administrator. Or if the search is not showing it, then goto Control Panel -> Administrative Tools and there you will find it. ** Now open it and you will see the dialog box as below. 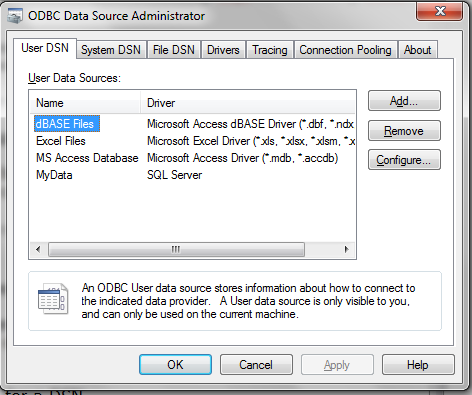 * To select a driver for creating a DSN, click on ADD and then select SQL Server from the list. After you select SQL Server as the driver for creating a DSN, and you clicked finished, a new dialog box will open asking for the Name, Description and Server. * So give any name to the DataSource, I am giving it "Code2LearnDataSource". * After giving DSN a name, then select the SQL Server by clicking on the drop down menu of the server. You will find the server that you made earlier using SQL Server. Take a Look at the image below, it should look like this. * Now click on Next and it will ask, how do you want to login, you can choose what ever you want. But as far as this tutorial is concerned use the 2nd option i.e. With SQL Server..
* After you select the 2nd option you will have to set the Login ID and password, so enter admin as Login ID and leave blank in password field. * Now when you click on NEXT you will get a conformation message saying that, Connection Successful. And then you will be asked whether you want to change the default database. If you have multiple database(s) then please make sure that you are using the right database otherwise the query will give an error. * Click on next and then finish. * After you complete the above steps, you will get a dialog box with an option to Test Data Source. So click on the button and let the JDBC-ODBC Bridge test the data source. * If the Test is successful you will get a message saying Tests completed successfully. 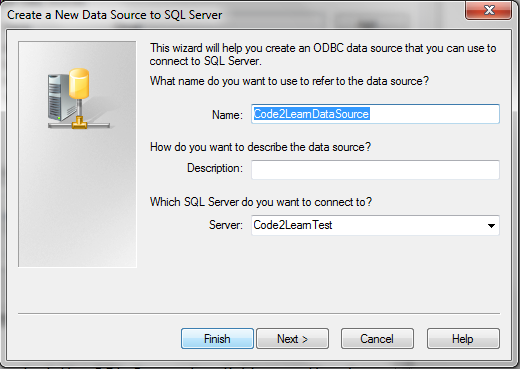 * Now return to Data Source(ODBC) and check whether your data source is there or not. * Load JDBC-ODBC Bridge driver. * Connect to the Code2LearnDataSource DSN. * Create and execute the JDBC statements. Save the above code as StudentInfo.java file.